Unscheduled Vacation ……. To Hospital! 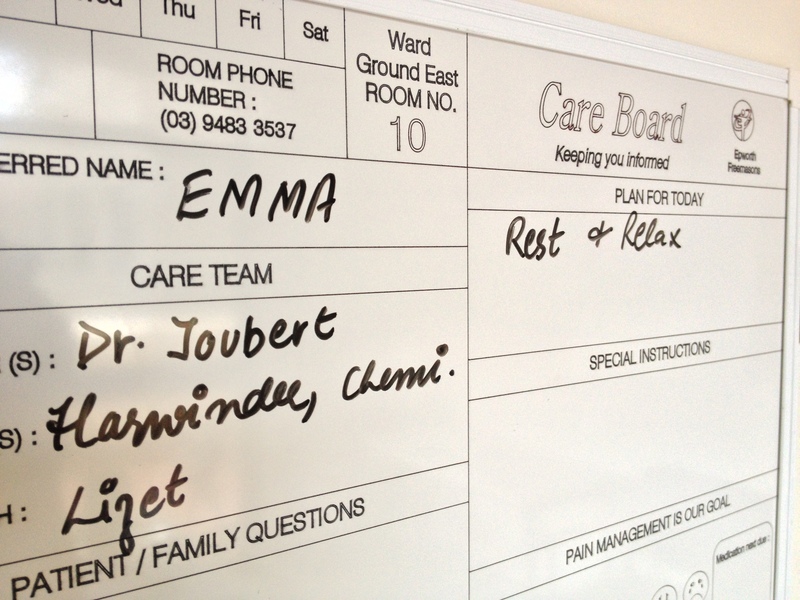 My health care board at hospital. 18th August I was diagnosed with Shingles. Which at that time I was quite surprised about. It definitely wasn’t on my to do list!! So I slowed down, had some time off, and did as the doctors told me. I took the antiviral medication like a good girl and rested. The shingles were located on the top of my head, with the pain radiating the left side of my scalp, forehead, temple, ear and eye. The pain was nasty, and would often have me in tears. However after a few weeks and some different medication things started to return to normal. I was still exhausted at the end of the day but I was coping. That was until the school holidays. The first week had been fantastic, I felt good, I had only one day of head pain, I was catching up on sleep, the house was clean and the girls were entertained. Then the girls got a virus, just some childhood virus, harmless, nothing that some Panadol (childs paracetamol) wouldn’t sort out. Then the virus got me! 28th September was when it all changed. I went downhill so fast, I couldn’t believe it. The pain I had increased ten fold…… I could barely have my girls talking in the house, which was no fun for them in the holidays. I was so ill, and the pain was so horrific that I wasn’t functioning as a parent or anything else. I even called my husband (who works away) for the first time ever in our relationship and I asked him to come home, because by this stage I was desperate for help. I have since been told off from many of my friends, as they didn’t know how ill I had been, because I was to proud to ask for help. My local GP referred me to a Neurologist who recognised the symptoms of Postherpetic neuralgia (PHN) which is nerve pain (neuralgia) that persists after a shingles rash has cleared. 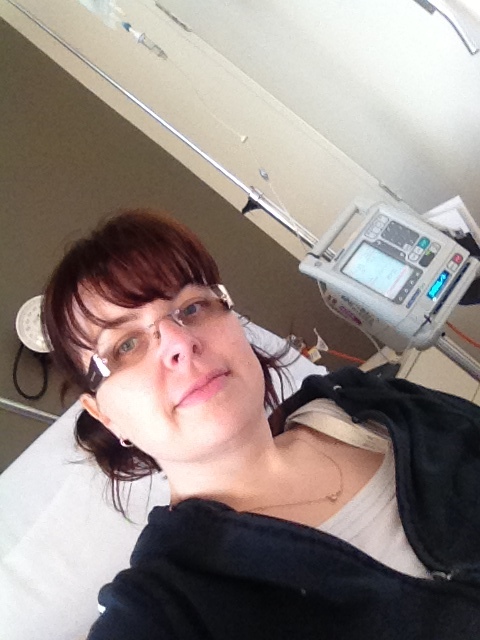 Within a few days I was admitted to hospital for 5 treatments a day over 5 days through an Intravenous drip. It wasn’t fun, and I hated being away from my family. I’ve never gone to hospital for an extended stay due to health issues before. It has been a strange year for me, very busy in all areas of my life. I had a few health issues this year and I didn’t listen to my body to slow down. I just kept on going, and going, and going!! The universe gave me many messages, warnings, red lights and I didn’t listen. Even my first official morning in the hospital I was showered, dressed and ready to do anything by 7.30am! It took 3 days for me to relax. During my hospital stay I had to figure out what I needed do to make changes in my life, how could I do things better, how could I be healthier. So I am improving my diet – I’ve always made my own sauces (don’t buy jars), specifically removing the junk food element. I don’t eat a lot of it, but I am quite partial to a bar of Cadbury’s. I am now trying meditating at a local Buddhist Temple, and applying those principles at home, even if it is only 15 mins. I am now exercising again, not excessively as I am still exhausted. I did walk about 6k today. I have also joined a gym, where there is a crèche so that I don’t have to worry about childcare. And I am taking some vitamins on a regular basis, not when I remember. More importantly I have to decide what is truly important in my life, and what isn’t. Baking is staying, I love the smell of my house when I’ve baked cakes or made cookies. Nothing like walking down a driveway of a house belonging to a home baker. I have a limit to what I make this year until a full recovery is achieved. 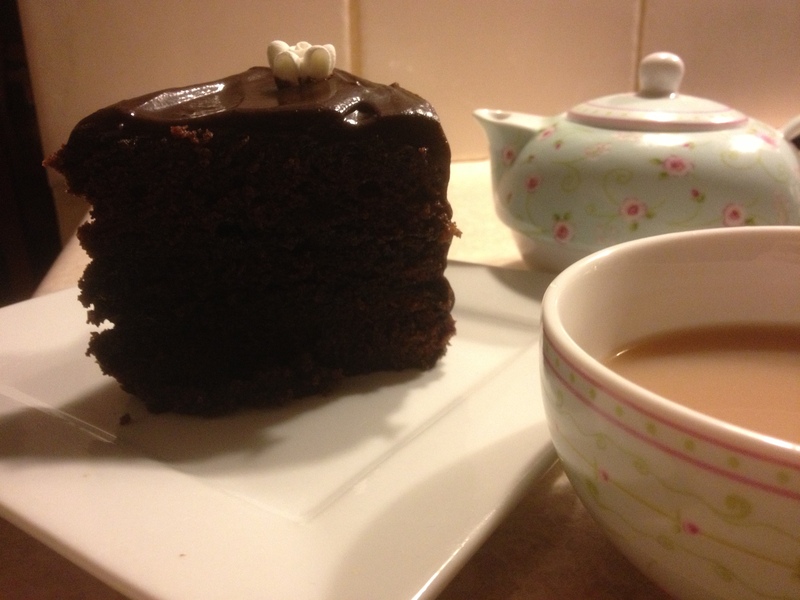 2 weeks after I came out of hospital I made my family a chocolate fudge cake – to clear those baking cobwebs. My way of saying thank you for putting up with me in the last few weeks. The cake was enjoyed by all, and because I had learnt some tricks of the trade, this years chocolate fudge cake, but last years to shame! 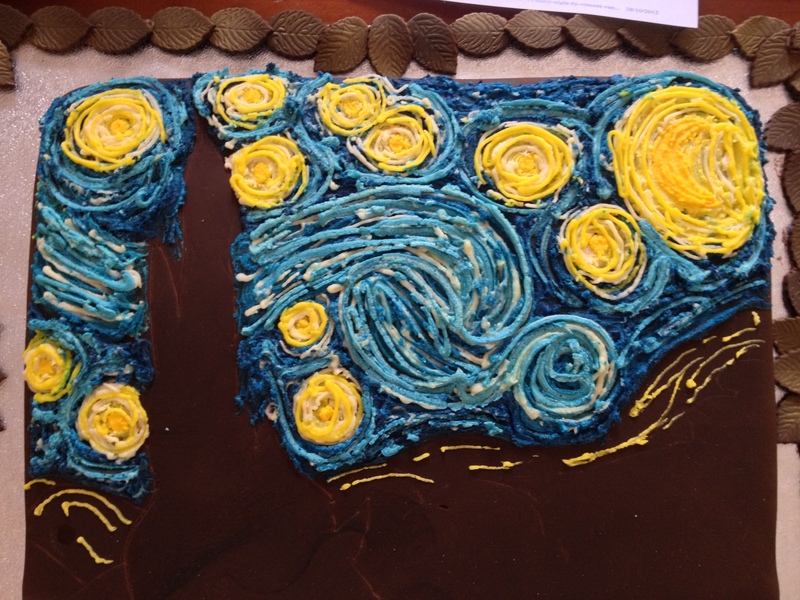 And I also achieved the Van Gogh Starry Night cake, donated to the local school to raise much-needed funds. It has taken nearly 2 days to recover from making that cake. Still having a little issue with tiredness! Which I know will go eventually once I get my energy levels improved. I don’t normally discuss health issues on here, I try to keep it about the cakes. However on this occasion I decided to share my experience. If I had paid better attention to my body I wouldn’t have got Shingles. I had a low immunity, because I was over doing it, not eating the best, not resting, or prioritising. And I have learnt that I have to ask for help. I allowed myself to get in a horrible place with my health. And only I was to blame. I hope that if someone reads this and recognises that this may be happening to them, that they can do something about it, before they end up like me and have their unscheduled vacation in hospital. And with a recovery that could take up to 6 months – and that’s if I do everything right. One last thing, if anyone has any tips or advice about how to improve energy levels I would love to hear from you. 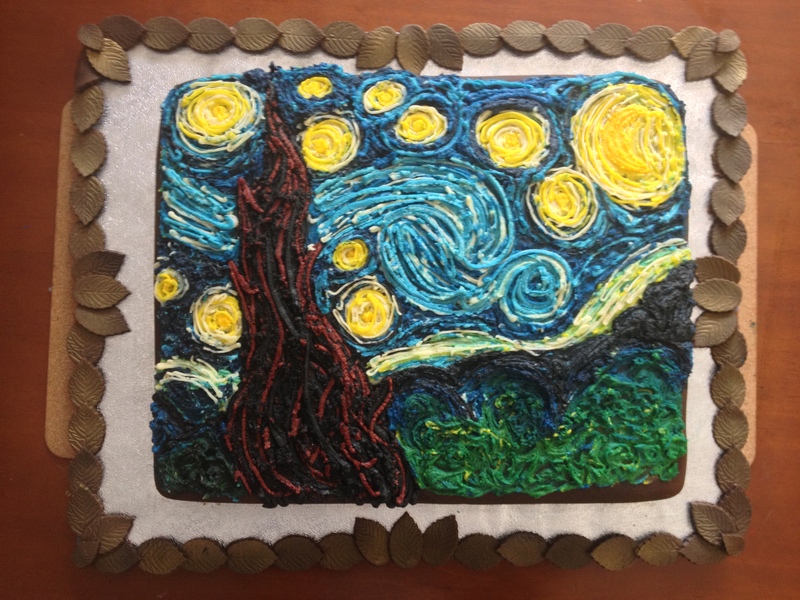 Here is my version of Van Gogh Starry Night. 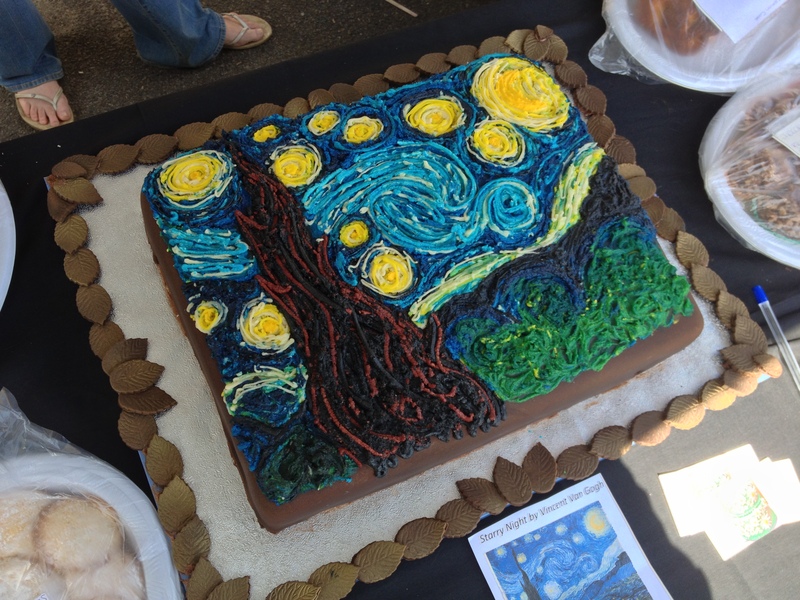 My canvas was chocolate cake, my paint was buttercream. My tools were piping bags, nozzles and a brush. The rest was me. I’ve never copied a work of art, so this was definitely a new thing for me. Technique — I made that up as I went along. Originally I was going to do a 3 tier version, but decided against that at the last-minute, due to finding a frame big enough to hold the cake. The cake measure 17×12 inches. 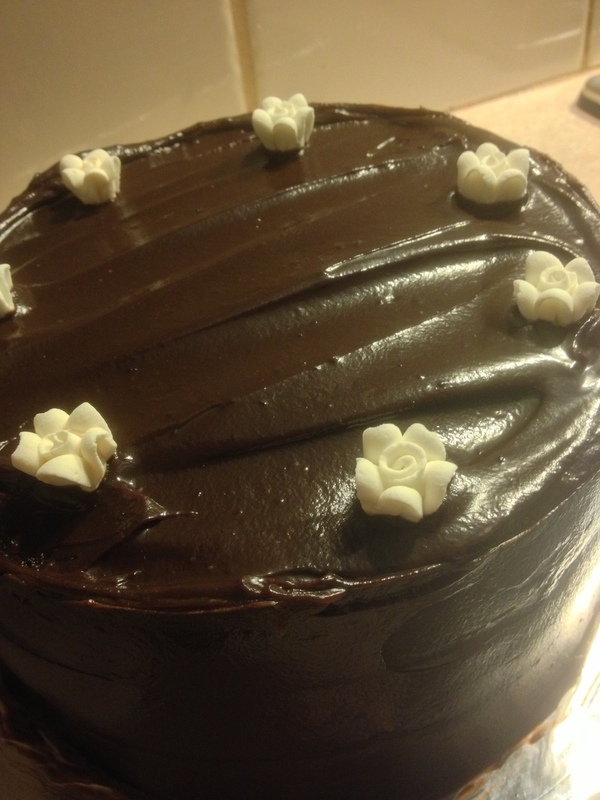 It is 2 layers of chocolate pound cake, orange sugar syrup and chocolate orange buttercream. 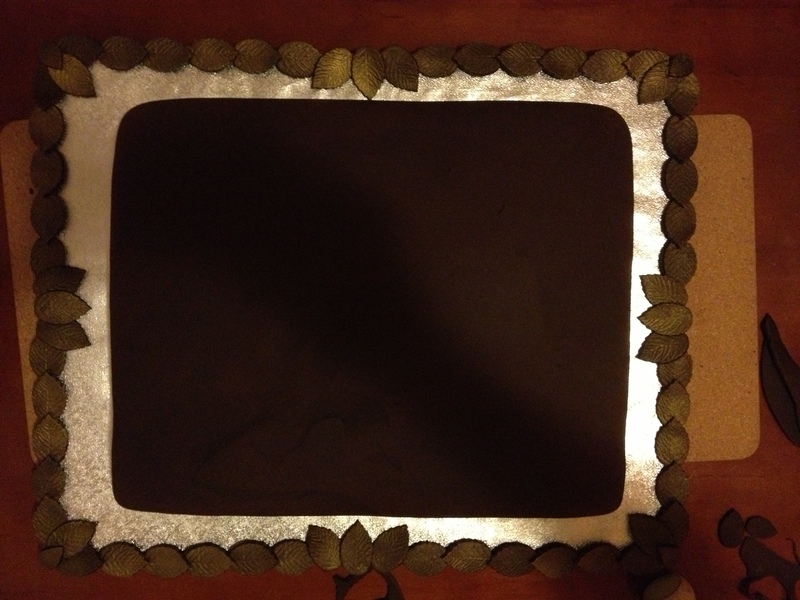 I added a chocolate fondant border made with leaves and gold shimmer spray. With the same fondant I covered the cake. Scribed a rough image onto the cake. I then called it a night (was getting weary). The next morning I mixed up large quantities of buttercream, which I then divided into 8 different colours. Before I started decorating I scribed a rough image onto the cake. More guideline than exact drawing. 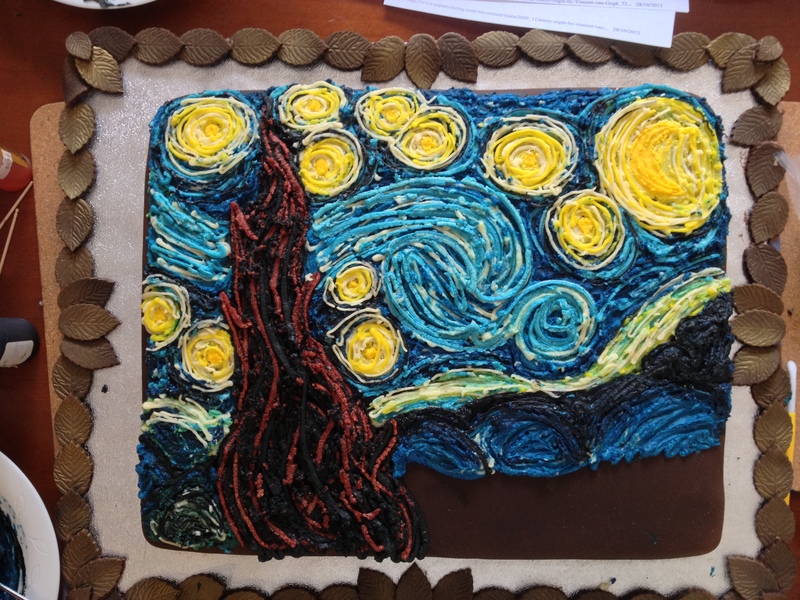 Icing was trial and error, I kept going until I was happy with it, as you can see from the above photo, a few of stars were larger than which I rectified before taking it up to the school for their Arts Expo. I really was very calm and completely stress free during the making of this cake. And honestly I didn’t over think it, I just went with the flow. It obviously doesn’t even compare to the original masterpiece, and I decided not to replicate the buildings (more to make my life easier). 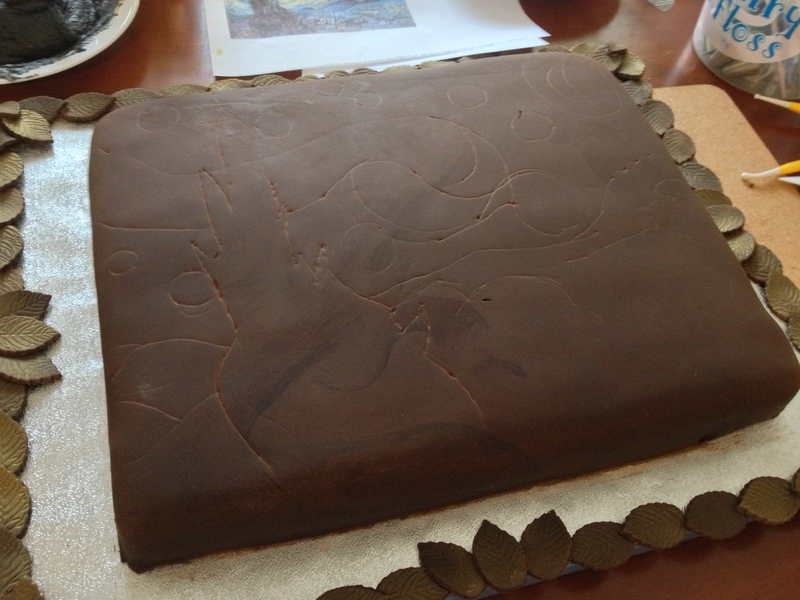 As a donated cake to help to school fund-raising I was more than happy with how it looked. There is a little tutorial on Facebook – Hollipops Cakes.